online appraisal | Skinner Inc. 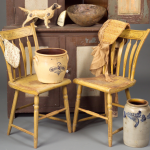 If you’d prefer to bring your item to an auction house’s gallery, don’t just drop by. Call first to make an appointment, to be sure the right specialist will be on hand to view your property. Bring all supporting documentation with you and tell the appraiser all you know about an an object — how long it has been in your family, where it came from, when it was purchased, who owned it, and how it came into your possession.